…and decides to bring up a politically charged topic. How does biological evolution sometimes feed into the ”clash of civilizations” narrative? Do Muslims accept biological evolution? Is evolution even taught in Muslim-majority countries? How can scientists make positive contributions to discussions over biological evolution? Salman Hameed, aka “Mr. Universe” on Monte Belmonte’s WRIS radio program, is Charles Taylor Chair and associate professor of integrated science & humanities in the school of Cognitive Science at Hampshire College. His primary research interest focuses on understanding the reception of science in the Muslim world and how Muslims view the relationship between science & religion. SciTech Cafe events are open all those with curious minds regardless of age and background. Our events, prizes and snack are free, but donations are appreciated. 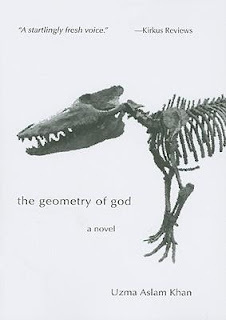 I should mentioned that one of prizes is Uzma Aslam Khan's novel, The Geometry of God, which is about a Paleontologist growing up in Pakistani in 1980s. What even cooler is that Uzma will be at the talk and will give three signed copies of the book.